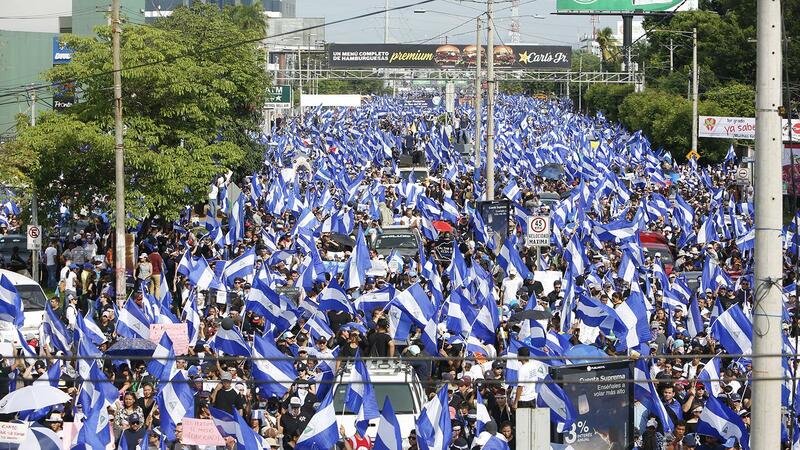 Protesters march through the streets of Managua, Nicaragua, on May 31, 2018. Anti-government protesters in Nicaragua have put up several roadblocks along the country’s Pan-American Highway—a major shipping route—stopping an estimated 6,000 transport trucks and cargo vehicles headed to ports in Nicaragua and Honduras. As a result, cigar shipments have been delayed. Drew Newman, general counsel for Tampa-based J.C. Newman Cigar Co., explains how shipping logistics normally work in Nicaragua. J.C. Newman Cigar Co. produces cigars at its PENSA factory in Estelí, Nicaragua. On average, it sends out a shipping container of premium cigars to the U.S. every week. “Roadblocks have been delaying shipments,” Juan Martínez, president of Joya de Nicaragua, told Cigar Aficionado. "Some transport companies have not been able to bring trucks to Estelí. So, yes, some companies have suffered delays. In our case and many others, everything is being shipped by air and it’s happening also with delays. A truck can take up to two days to get to the airport [Augusto C. Sandino International Airport] and back. To be precise—shipments are happening with delays, but happening." Cigarmaker and tobacco grower A.J. Fernandez is also experiencing difficulties, not just with outgoing shipments, but with employees getting to work as well as third-party collaborators from other companies. Protests around the country erupted in April when President Daniel Ortega announced a tax increase and an overhaul to Nicaragua’s social security system. Most of the protesting took place in the capital city of Managua, but some of the violence spread to the cigar-making city of Estelí. For a while, the violence seemed to have died down and the premium cigar industry was not initially affected. Now, many reports have the death toll as high as 100 people, and the road barricades have disrupted the cigar industry’s ability to move product from factory to port. For the past two years, Nicaragua has been the largest supplier of premium cigars to the United States. Exports from Nicaragua grew steadily over the last decade. In 2017, Nicaragua exported 148 million premium cigars to the U.S.—more than any other country.